An owner of a building, land, or improvement upon which a subcontractor's mechanic's lien may be filed, is not required to pay the original contractor any compensation for work done or material furnished for the building, land, or improvement until the expiration of ninety (90) days after the completion of the building or improvement. I.C. 572.13(1). However, payment may be due sooner if the original contractor furnishes the owner with one of the following: a) receipts and waivers for any claims for mechanics' liens, signed by all persons who furnished material or performed labor for the building, land, or improvement; or b) good and sufficient bond to be approved by the owner, on the condition that the owner will be relieved from liability for any loss which the owner may sustain by reason of the filing of mechanics' liens by subcontractors. I.C. 572.13(1). "Persons or companies furnishing labor or materials for the improvement of real property may enforce a lien upon the improved property if they are not paid for their contributions, even if the parties have no direct contractual relationship with the owner." If there is no written contract between the original contractor and the dwelling owner, the original contractor must, within ten (10) days of commencement of work on the dwelling, provide a written notice to the dwelling owner stating the name and address of all subcontractors that the contractor intends to use for the construction and, that the subcontractors or suppliers may have lien rights in the event they are not paid for their labor or material used on this site. Id. The notice must be updated as additional subcontractors and suppliers are used from the names disclosed on any earlier notices. Id. 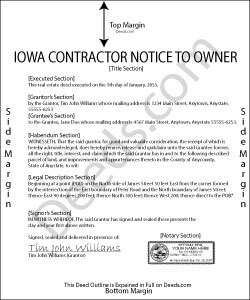 This notice is essential as any original contractor who fails to provide notice is not entitled to lien rights. Id. This article is provided for informational purposes only and should not be relied upon as a substitute for the advice from a legal professional. Please contact an Iowa attorney with any questions about sending notice to a dwelling owner or anything else with regard to mechanic's liens.